Students of all ages are invited to come!!! There will be a $50 participation fee to cover costume costs for all those who are cast in the play. Laugh your socks off in this fairy-tale pop musical with eclectic styles ranging from 50s rock to 20s jazz to Celtic and more! The kingdom of Glump has been falling apart ever since the pampered emperor became wrapped up in his tasteless wardrobe! Not only is he a big-headed clothes-aholic, his three "lovely" daughters are quickly becoming chips off the old blockhead. Enter two con artists, Wart and Hog, who devise their ingenious plan for fleecing the emperor. Naturally, everyone pretends to "see" the magic cloth, until the emperor’s serving boy covers him up at the parade, laying bare the facts: the emperor has no clothes on! The serving boy’s honesty is contagious, and the emperor has quite a revelation. He’s been blind to his own selfishness — and nakedness! — until this fateful day. But make way for one more hilarious scene in which his daughters, who haven’t heard the news, appear in their underwear, too! (Tastefully done, we promise!) As the girls angrily chase Wart and Hog offstage, the emperor vows to his people that he will not only keep his underwear under wraps, but he will reform his ways... and his daughters! The naked truth has never been funnier! This production, which is sponsored by Marty & Linda Davidson, will be directed by Sidney Covington. David Benson will be the Musical Director. Choreographers will be Jonah Murphy and Melanie Walton. Ellie Massey and Carol Sue Wiggins will be the production co-ordinators. 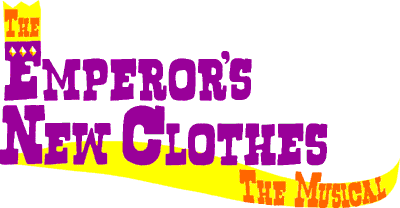 The Emperor's New Clothes -- The Musical will be produced by special arrangements with Pioneer Drama Services, Inc., Englewood, Colorado.